the Minnesota Daily has been a force for change on the University of Minnesota campus. The Minnesota Daily has covered many big events, including the end of compulsory military drills, the beginning of women’s suffrage, and campus riots. The Minnesota Daily believes in the power of the press to bring about change. Since its beginning, the Minnesota Daily has been at the forefront of technological advancements, and it was among the first college newspapers in the country to be available online. Supervise all Daily editorial operations including the news, opinion, multimedia and A&E desks. Exercise exclusive authority over the news coverage and editorial content of the Daily. Ensure that the paper provides fair and accurate information of interest to the University community, reflecting diverse viewpoints and issues of importance. Supervise Daily editorial operations including employees, funds, and property in accordance with Board policies and good management practices. Organize the editorial staff providing for selection, promotion, discipline, and dismissal. Demonstrate problem-solving within the editorial departments. Write occasional editorials, columns and blog posts. Help edit content, supervise special issues and direct the content development of the website. Enforce appropriate policies and procedures to ensure accountable, fair, and efficient management. Work with the Business Operations Officer and General Manager to develop an annual budget of anticipated expenses for the editorial departments, subject to Board approval. Consult regularly with the Business Operations Officer, General Manager, and the Board of Directors to ensure coordinated and efficient operation of the organization. Assist in developing and implementing hiring, staff development, compensation, discipline, and grievance policies. Report all necessary information to the Board including all appointments of directors and editors, all dismissals, all substantial complaints and resolutions, and all changes in managerial or editorial policies. Must have at least one year of successful experience at a newspaper or other news organization. Must possess strong news judgment and an understanding of newspaper operations, journalistic ethics, and appropriate media law. Must demonstrate management and staff leadership skills, with the ability to manage and motivate a diverse staff and provide an effective training environment for students. Must be capable of handling confidential material. Write a departmental summary of accomplishments for the Board of Directors. Represent the Editorial Department at Board of Directors meetings. Pay attention to special issue dates and plan for those issues. Plan an all-editorial training session early each semester. Schedule meeting and deadline times. Create semester goals for the Editorial Department & develop plans to execute those goals. Give budgeted merit increases to deserving employees. Work with fellow OP members to create the financial budget. The EIC is responsible for all aspects of the editorial division’s budget. Work with fellow OP members to create the Daily’s student fees request and participate in the process. Work with fellow OP members on any long-term project impacting the Daily as a whole. Create and maintain relationships with media professionals, board members, University officials, the Daily’s lawyer and organizations on campus, including but not limited to multicultural groups. Keep all editorial departments within their budgets, unless there is a significant reason not to. Note: Because this position requires extensive institutional knowledge of the Minnesota Daily’s newsroom and other operations, the Editor in Chief position is an internal hiring opportunity and not available open to the public. You do not need to be in the journalism school to apply for this position. We welcome applicants from all majors and backgrounds! You’re well read, you’ve got a gnarly sense of curiosity, you’re not afraid to talk to strangers — sounds like you’re a budding journalist. The Minnesota Daily is looking for writers who enjoy fast-paced environments, and are ready to put pen to paper and scout out important stories affecting the University of Minnesota community. Do you have an interest in writing, but haven’t found a place to hone your craft? Are you interested in sharing important and meaningful stories to the University of Minnesota’s large, diverse community? 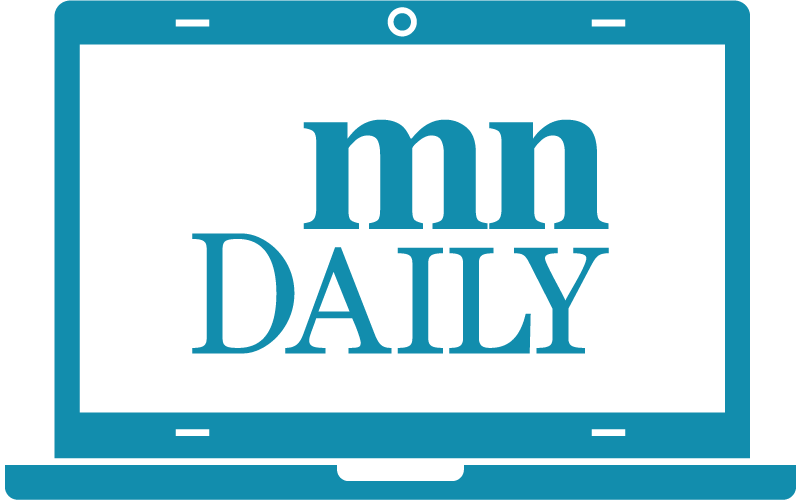 The Minnesota Daily is looking for perceptive young writers to fill our reporter intern position. Learn how to be vigilant, talk to sources and think creatively about news delivery. This entry-level reporting position will allow you to learn about journalism from you fellow peers in an upbeat, exciting atmosphere. Makes sure reporters are making deadline, planning for stories, etc. You’re well read, you know the game, you’re not afraid to talk to strangers — sounds like you’re a perfect fit for the Daily’s Sports Intern. The Minnesota Daily is looking for young writers who enjoy fast-paced environments, and who’re ready to put pen to paper and scout out stories about Gophers athletics. Must have interest in multiple areas, including theater, restaurants, books, stores, etc. You’re well read, you’ve got a gnarly sense of curiosity, you’ve got a deep-rooted love for the arts scene — sounds like you’re a budding A&E reporter. The Minnesota Daily is looking for young writers who enjoy fast-paced environments, and who’re ready to put pen to paper and scout out important stories affecting the University of Minnesota arts community. Success in a University writing-related class strongly advised (knowledge of grammar, style conventions, etc. is essential). Do you like writing clearly-articulated, incisive arguments? Do you have a propensity to frame news stories within a larger context? Are you trying to find your voice as a writer? Sounds like you’re a budding columnist. The Minnesota Daily is looking for young writers who enjoy fast-paced environments, and who are ready to put pen to paper to provide smart, fresh perspectives for the University of Minnesota community. Do you like to draw? Do you enjoy expressing your opinions on current events through your art? Do you enjoy politically charged commentary that uses satirical devices? Sounds like you’re a budding cartoonist. The Minnesota Daily is looking for cartoonists who enjoy fast-paced environments, and who are ready to tell visual stories about the University of Minnesota community. Are you diligent and precise with language? Do you nitpick grammar? Are you passionate about AP style? Sounds like you’re a budding copy editor. The Minnesota Daily is looking for young copy editors who enjoy fast-paced environments, and who are ready to help make the Minnesota Daily newsroom’s copy crisp and clean. The chief page designer is responsible for designing and organizing the overall look of the paper for the Minnesota Daily, the independent student-run news organization at the University of Minnesota. The chief page designer will work closely with other Daily employees to present a cohesive and creative print. The visuals designer is responsible for creating interesting and reader-friendly layouts for the Minnesota Daily, the independent student-run news organization at the University of Minnesota. This includes print layout of cover pages, special issues, and graphics. The visual designer will work closely with other Daily employees to present a cohesive and creative print layout. You like to be behind the lens, you’ve got an eye for shooting expressive images — sounds like you’re a budding photojournalist. The Minnesota Daily is looking for young photographers who enjoy fast-paced environments, and who’re ready to tell visual stories about the University of Minnesota community. You like to be behind the lens, you’ve got an eye for filming expressive images — sounds like you’re a budding videographer. The Minnesota Daily is looking for young videographers who enjoy fast-paced environments, and who are ready to tell visual stories about the University of Minnesota community. Ability to work some weekends and nights at promotional events and/or activities if needed. newsroom and will interact with the Social Media Manager on a regular basis. Be responsive when news breaks and social media strategies are needed.